Mavis spends a great deal of her time helping people through distant healing, she uses her spirit links to send the healing thoughts to her many clients who have requested help in a wide variety of ways. She asks the Great Spirit for ‘divine intervention’ in all situations and in some cases this may be a peaceful and pain free transition to the spirit world. 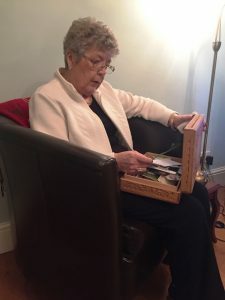 Mavis has a healing box in which she keeps photographs of the people she is helping, this enables her to have a direct focus for her links. She often uses colour in her visualisation to heal particular areas of the body, indeed she is a keen proponent of the use of colour to assist general wellbeing. She encourages people to wear specific colours depending upon their needs for example; red for power, lemon as antibiotic and blue as an antiseptic. The use of colour is also important in the environment and Mavis provides support and advice on the correct colours for different contexts, for example, nurseries, hospitals, particular businesses. The impact colour can have on behaviour and energy is amazing. It is important to note that although Mavis firmly believes in the power of spiritual healing she also believes in the need to combine with conventional medical practice. After all God has provided doctors, surgeons and researchers with their great skills and there is no doubt they will also be influenced by spirit in their work.